A cardiac stress test can determine your risk of heart disease, but often requires follow-up testing. What can a cardiac stress test tell me about my heart? Once it was common for a man middle-aged or older to get an annual exercise stress test to make sure his heart was still ticking like a fine watch. But expert guidelines now discourage such "just in case" stress testing. Is this trend against stress testing healthy for older men? We asked Dr. Deepak Bhatt, a professor of medicine at Harvard Medical School and chief of cardiology for the VA Boston Healthcare System, for insight into what an exercise stress test can and cannot tell you about your heart. With caveats, the procedure still has a valuable role to play in diagnosing worrisome symptoms like chest pain—especially in older men with risk factors for heart disease. "An exercise stress test is not 100% accurate—no medical test is," Dr. Bhatt says. "But it helps decide what the next step should be." In a stress test, you walk on a treadmill that makes your heart work progressively harder. An electrocardiogram (ECG) monitors your heart's electrical rhythms. The doctor also measures your blood pressure and monitors whether you have symptoms like chest discomfort or fatigue. Abnormalities in blood pressure, heart rate, or ECG or worsening physical symptoms could point to coronary artery disease (CAD): fatty deposits (plaques) that reduce the flow of oxygen-rich blood to the heart muscle. If stress testing were 100% accurate, everyone would be having them regularly. But stress testing doesn't accurately diagnose all cases of CAD, and sometimes it points to CAD in people who do not actually have the condition. "The test result is never, by itself, certain," Dr. Bhatt says. "It can be used to move the probability up or down of there being coronary artery disease. It can't absolutely rule it out or diagnose it." What does a stress test show? For men with symptoms like chest pain with activity or unexplained shortness of breath, an abnormal stress test points to a higher risk of CAD. But it's more worrisome in a man who also has risk factors like older age, being overweight, or high cholesterol. "This points strongly to coronary artery disease." Dr. Bhatt says. Confirming it could require further testing. If you have symptoms and the test result looks normal, the risk of CAD is lower. "That person is less likely to have significant coronary artery disease," Dr. Bhatt says. Even so, the doctor might still want to do more tests. But it's important to understand that a "normal" stress test can't rule out the chance that a plaque will later rupture and block an artery—the proverbial tale of the man who passes a stress test with flying colors and then has a heart attack a week later. Stress testing detects arteries that are severely narrowed (70% or more). This is what causes symptoms. Heart attacks often result from lesser blockages that rupture and form clots. The U.S. Preventive Services Task Force, an independent panel that makes recommendations to doctors, urges physicians not to routinely offer exercise stress testing to people without symptoms or strong risk factors for CAD. Physician groups like the American College of Cardiology support this recommendation. The final decision, though, falls on you and a doctor who knows your health profile. "The guidelines leave a lot to physician judgment, because we're sometimes in a gray zone where we don't really know what's the 'right' thing to do for everyone," Dr. Bhatt says. 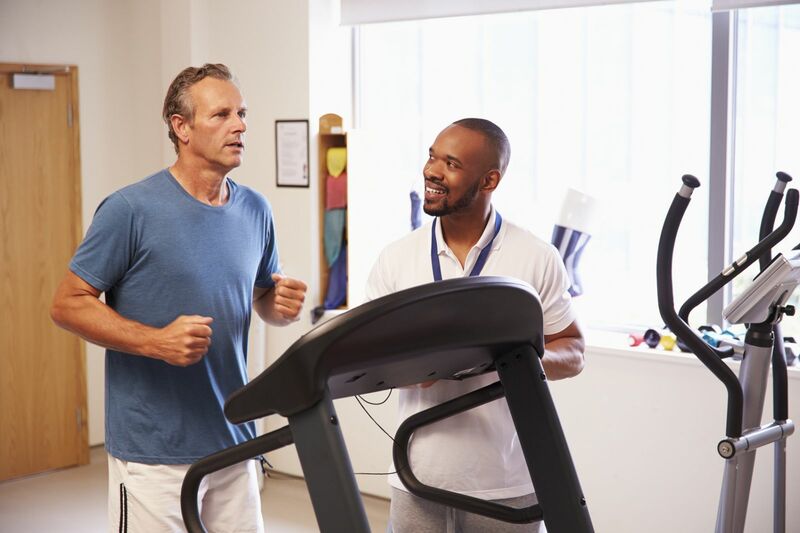 Although the tide has turned against exercise stress testing of otherwise healthy men concerned about their heart risk, guidelines say that a stress test could be "considered" in a man who is older and relatively inactive but embarking on a vigorous new exercise program. "In that case I would recommend a stress test," Dr. Bhatt says. An exercise stress test is designed to find out if one or more of the coronary arteries feeding the heart contain fatty deposits (plaques) that block a blood vessel 70% or more. Additional testing is often required to confirm the test result. You do not have significant coronary artery disease (70% or greater artery blockage). You could still have a heart attack if a smaller blockage (less than 70%) ruptures and forms a clot. Your doctor may want to do further testing if you have other risk factors for heart disease that raise concern. You may have significant coronary artery disease (70% or greater blockage). The abnormal result may be a false alarm, and could require further testing to confirm. The doctor may order additional tests to confirm that you have coronary artery disease.